Is it just me, or do you crave Fall-like foods even when it’s sweltering and Spring-Summer-like outside? I never seem to have a problem when it comes to eating apple or pumpkin anything, regardless of the time of the year. I had been craving something appley (that’s a word right?) 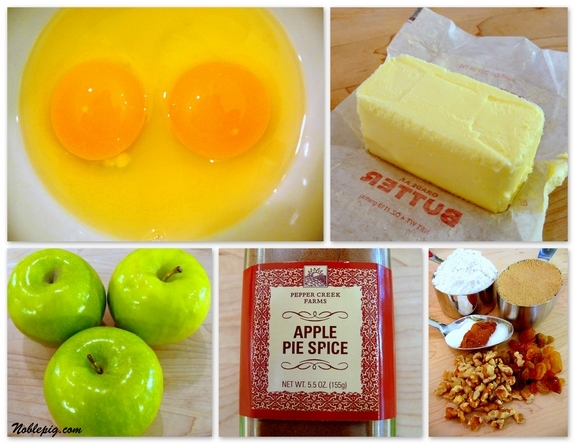 but was too lazy to make a pie so I played around with some ingredients until I came up with these Apple Spice Bars. Yum. These were exactly what I was craving. When I was searching around the pantry I found a box of golden raisins which I added to these bars. For the most part, I am not a raisin fan but golden raisins are something different. I love them and they really added to my enjoyment of this dish. Here’s what you will need: Eggs, all-purpose flour, butter, Granny Smith apples, apple pie spice (if you don’t have this, I will tell you how to make your own), golden brown sugar, vanilla extract, golden raisins, walnuts, baking powder, cinnamon, table salt and powdered sugar. Whisk together 2 cups all-purpose flour, 2 teaspoons baking powder, 1 teaspoon apple pie spice, 1/2 teaspoon cinnamon and 1/2 teaspoon table salt. Set aside. With an electric mixer blend 1/2 cup butter and 2 cups packed golden brown sugar; about 2 minutes. Add 2 eggs and 1 teaspoon vanilla and blend until smooth. Gradually add flour mixture and blend only until incorporated. Stir in 1-1/2 cups diced apples, 1/2 cup golden raisins and 1/4 cup chopped walnuts. Prepare a 9 x 13 pan by either liberally coating it with cooking spray or lining it with parchment paper (as I always do). Spread apple mixture into prepared pan and bake in a 350 degree oven for 30-35 minutes or until a toothpick inserted in center comes out clean. If you lined your pan with parchment, let the bars cool for ten minutes and then lift out of the pan, otherwise wait until bars are completely cool before cutting them into squares before removing. Sprinkle squares with powdered sugar. This was the perfect afternoon treat. I love me some apple bar crack. How about you? Now pack up at least a dozen of these bars and run them over to a friend’s house, otherwise you will eat them all…as I almost did. What’s going to happen to me when I move out to the country and I have no one around me to dump copious amounts of dessert on? I see some new, bigger pants in my future. Ugh. Whisk together flour, baking powder, apple pie spice, cinnamon and salt. Set aside. With an electric mixer blend butter and brown sugar; about 2 minutes. Add eggs and vanilla and blend until smooth. 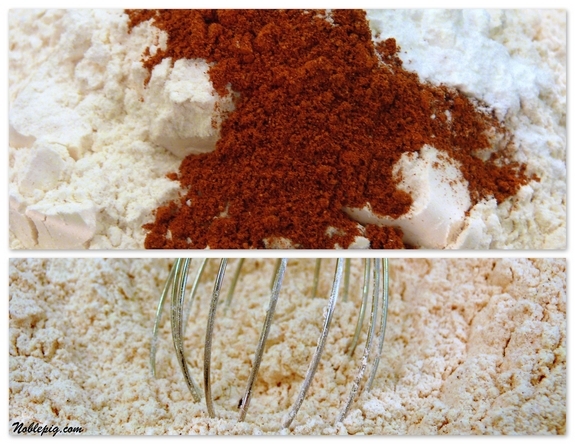 Gradually add flour mixture and blend only until incorporated. Stir in apples, raisins and walnuts. *If you do not have apple pie spice you can make it by combining 1/4 cup ground cinnamon, 1 Tablespoon ground allspice, 2 teaspoons nutmeg, 2 teaspoons ground ginger and 1/2 teaspoon ground cardamom (optional). Store in an air tight container. As long as it’s great food…the season doesn’t matter to me! Looks great! Man, I need to just spend about a week going back through all the recipes I’ve been drooling over and start making them! I do the same thing. I crave fall foods all year round. I think it is because they are most comforting. Chili, pumpkin bread, anything that is spicy cinnamon-y sounds good to me any time. Those bars look great, but I’d have to remove those sneaky blonde raisins. They scare me. Apple bar crack – that was awesome. These look amazing! We’ve still got the spring weather going on back here in MA, which is similar to fall weather, so these bars would be perfect! I could eat a half dozen of these right now. They look so tempting. I feel weird if at least a couple times a month I do not make my normal fall/winter dishes. The same way I feel weird if I do not grill out a burger every now and then in the winter time. Looks amazing and still a good treat here since our weather is Spring screwy. Yes, apple-y is a word! Yes, golden raisins are sublime! With one minor adjustment (Cough *pecans* cough) these would be perfect! Looks de-lish to me. Whatcha got in pumpkin, I just opened a big can the other day and only used 1/2 c.
cathy I crave a TON of pasta salad in the heat. I don’t know why. But your bars with a ton of stuff on them is PERFECT anytime of year. Damn those look good! Wonderful! I haven’t had my breakfast yet and I could so see myself eating one of those bars with my coffee! I made a very fall like pot of chili for dinner yesterday, so yes I understand craving for “fall” food! Did you see my post today? I made a fall apple cake, when I should be making rhubarb crumbles! You’re talking to a huge apple fan here, these look amazing! There is nothing like an apple dessert, nothing!! I was sure, after picking more than 25lbs of apples this past autumn that I’d never want to see another one again. I was up to my elbows in apple everything. But I could very well be tempted to make these. They sound so yummy and they look divine. I love apple crack too, LOL! These look delicious and i love apple anything any time of year. I love the golden raisins and nuts in here…yum! Those are looking delish, love the apples and raisins and nuts! These look great. I am in Seattle and we are experiencing some extremely fall-like weather (I assume you are too.) When I walk outside and can see my breath in morning, apple starts to sound really great. Oh I bet these would be so good with a big scoop of ice cream! And I think it always works out that way that we want what’s not in season. I see it as helping the economy, since you end up forking over a boatload for strawberries in the dead of winter. Very scrumptious looking bars, I like apple anytime of the year. Love the spices in there too, make the house smell wonderful when you bake this. These apple bars look amazing! 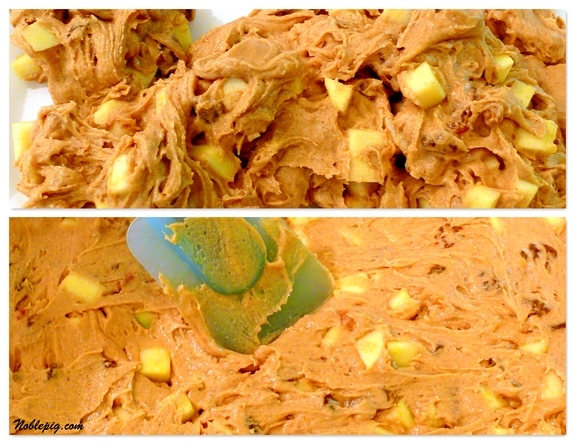 I make apple and pumpkin recipes all year long, just because they are my favorites and I really crave them! I’ll have to add these yummy bars to my list! Oh Cathy – you have me craving one of these. Yet another recipe of yours I want to try. Another winner, but I think I’ll modify it one little bit to add a few more needed calories: maple glazed icing. I definitely crave off-season foods all year long. That does kind of mean buying non-local produce, which is supposed to be the wrong thing to do, but sometimes the craving just hits you. I’d eat these apple bars happily in the middle of July. Not that I would know anything about hot spring and summer weather. Warmth seems to be a foreign concept here in NY. Your egg photo is excellent. It reminds me either of googly eyes or breasts! Yummy! And good any season! 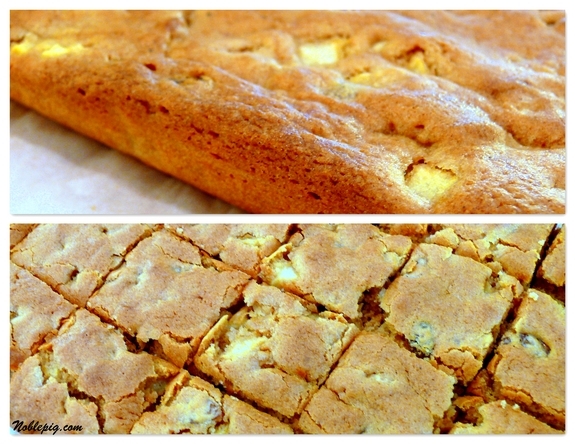 Apple spice bars are right anytime of the year…there is nothing better. Oh yes, treats like these in the house will expand your bum! They look good enough to eat the entire pan. Yum! Love this kind of dessert. I would keep nibbling away until I ate the whole batch. Yummy, and these are healthy, so I can cancel that gym membership as well. Having just celebrated the arrival of spring here in Montreal (finally), I can’t say I’m craving anything about fall. I try to forget that any seasons besides spring and summer exist. BUT I do love me some apples. Those creations look fantastic. 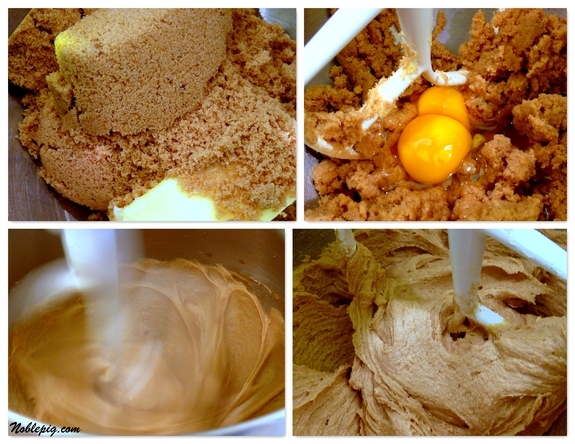 And, I know this may sound weird, but your mixing photos (dough, batter etc) always get me. They are so striking and they make me really hungry. I laughed out loud when I read this! Well it looks like spring but feels like fall so I would say that it wouldn’t be abnormal to want these now! Mmmmm! No–I don’t mind apples and pumpkin year round either! I would definately eat these in the 100 degree SA heat! Mmmm! Apples, walnuts and spice are nice anytime! Funny you should mention this as I keep thinking about homemade applesauce and a pork roast. But who would eat that with me in SoCal in May? I made pumpkin bread over the weekend even though it was wildly out of season! These bars look delicious. If, like me, you’re too lazy to dice your apples, you can quarter them, feed the quarters through the shredder blade of your food processor, and, voila! Little apple pieces! and most of the skin will stay on top of the blade; that which ends up shredded helps you meet your fiber requirements for the day. And now I want apple crack, too! Season doesn’t matter too much to me in terms of food! I crave for weird things at weird times =) Looks sooo yummy! So beautiful… the apple bars and the photos! I love the way you lay it all out. Nice blog. I just came across your site from The Hungry Housewife… I will have to keep up with it! I’ve been known to make a pumpkin pie in July, just because. You know. My mom always kept some sliced apples in the freezer so we could make apple cake in the summer. Smart. Sometimes you have to feed the craving! I can’t wait to try these bars! I had this exact kind of craving and made some apple muffins. I wish I saw your post before making mine because I would’ve loved to try some spice bars! Ah, we’ve both been in a apple frame of mind. 🙂 I’m crazy about pumpkin, too, so I’ll eat that any time. Sometimes I have frozen pumpkin (from cooking a fresh pumpkin), but otherwise, I’ll make do with canned. All our family loves these treats all year long. I love apple baked goods 365 days of the year. No seasons need apply. And I’m pretty sure with all the yum you’re cooking up, you will find some new friends to share your bounty with really quickly. Cathy, these sound so good. I love apple “anything” so you have an appreciative reader here. Yum..love those chunky apples and raisins in there. Fall is my favorite season (in areas where they have seasons) so I’m all for eating autumny foods year round! You’ll be so busy, you will work off all the calories you eat. But, if end up with chickens or dogs, you can always share extra food with them. My chickens and dogs love scraps. The dogs only get meat scraps now because they are all so fat. That makes the chickens happy cause they get fed more. Those look yummy. And yes I have that problem. I live in Phoenix and Im always wanting to make stews and foods that just arent great for 115 degree days. These are perfect for any time of year, I would think. I know my husband would love them. I am always tempted to buy that apple pie spice you have pictured. I will have to grab one next time and give these bars a go. Hi Cathy .. I have to comment .. I love the picture of the egg yolks = fantastic!! Just visiting San Diego from the UK .. one day I’ll make the trip up the coast and find your little valley ..
Can’t say that I do, but now you’re got me thinking. I could never say no to any slow braised meats regardless of season. We (well, mostly hubby) crave apple desserts all year round. Lucky thing that apples are available all year round. These bars look fantastic and are definitely a must-try! Imagine scroll down slowly and those two bright yellow eggs come into view and I burst out laughing. Don’t ask. These bars look super yummy though! Those look delightful! I love making anything baked anytime of year. Just do. Ya know… in all your baking, have you ever come across a muffin recipe with carrots, zucchini and ginger? There a local nursery with a small rustic coffee shop that makes carrot zucchini ginger muffins. Oh how I want to make my own. If anyone knows of something like that (or could create it) it’s you! They were so delightful! I made these last night….FANTASTIC! I prepped more apples than I originally needed, which is fine as they are so popular I’m making a 2nd batch tonight. This recipe is stuck in our family cookbook from this moment on! If you’re in uncomfortable position and have no cash to get out from that, you would need to take the personal loans. Just because that will help you definitely. I take credit loan every year and feel myself OK just because of this. Have you tried this with any other flour rather than the all purpose white flour? I’m sorry I have not.